The opening weekend of the Scottish Premiership season saw five players scoring on their league debuts for their new clubs. 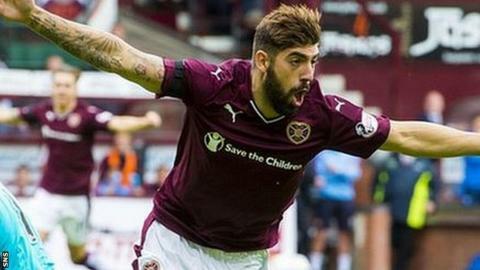 Juanma Delgado (Hearts), Rory Loy (Dundee), Wes Fletcher (Motherwell), John Sutton and Graham Cummings (St Johnstone) all marked their league debuts with goals. With the Championship, League One and League Two set to commence this weekend, players will look to add their names to the lists of debut scorers. BBC Scotland has a look back at some unique goal scoring debuts in Scottish football. If the pressure of having to live up to the £12 million record Scottish transfer fee paid to Chelsea was not enough, Tore Andre Flo made his league debut for Rangers at Ibrox during the derby game with Celtic. The Norwegian international was to make an immediate impact, scoring Rangers' second of the match as they ran out 5-1 winners. Flo had scored on his debuts previously for Brann Bergen and Chelsea. The former Chelsea player went on score 40 goals during two seasons at Rangers before moving to Sunderland. After a trophy-laden three years at Celtic Park, and a year in the English Championship with Bristol City, Paul Hartley signed for Aberdeen in the summer of 2010. Hartley's league debut was one to savour, scoring a unique hat-trick of penalties as Aberdeen beat Hamilton 4-0 at Pittodrie. It was the first time since Donald Ford scored three from the spot in a league match for Hearts against Morton in 1973 that the feat had been achieved. The current Dundee manager hung up his boots at the end of that campaign before beginning his managerial career at Alloa the following season. Celtic signed both Gary Mackay-Steven and Stuart Armstrong during the 2015 January transfer window from Dundee United in a combined £2 million deal. Both made their competitive debut against Partick Thistle at Firhill with both endearing themselves to their new supporters. Mackay-Steven took only 38 seconds to open his account before his fellow new signing followed suit by doubling the lead in a 3-0 victory. It is rare for a goalkeeper to score a goal during a game, it is even rarer for them to do it on their league debut for their new club. However, that is exactly what Mark Oxley managed to do last term. His first start in the Championship came against Livingston after agreeing a six-month loan deal to play at Easter Road. Oxley scored what would turn out to be the winner after 19 minutes as his goal kick sailed over his opposite number after a misjudgement in the flight of the ball by Darren Jamieson. Despite conceding, Hibs held out for a 2-1 win. The Englishman secured his place in the Hibernian record books as he became the first keeper in 27 years to score for the Leith club after Andy Goram had done so in 1988. Oxley signed a permanent two-year deal for Alan Stubbs side this summer. Hans Gillhaus became Aberdeen's record signing when he was bought from Dutch side PSV Eindhoven for £650,000 in November 1989. The nine-times capped Netherlands forward showed managers Alex Smith and Jocky Scott what they had signed as he acrobatically opened the scoring with an over-head kick against Dunfermline at East-End Park, before scoring a second to send the away support into raptures. Gillhaus continued to score important goals for the Dons and would go on to lift that season's Scottish Cup. The Dutchman is currently a scout at English Premiership side Sunderland. David Clarkson has scored on his full league debut twice in Scottish football. Making his first start as a 17-year-old he scored after nine minutes in a 2-2 draw against Partick Thistle in 2003. After a spell in England, Clarkson returned to Scotland and signed for Dundee. He scored on his debut in a 2-1 defeat at Ross County but would then go on to score in his next seven games as Dundee secured a top six finish on their return to the top flight. Clarkson could not repeat his scoring on debut feat as Motherwell kicked off their Premiership campaign last weekend with a 1-0 win thanks to a Wes Fletcher debut goal. Having recently reformed, Motherwell's ladies currently play in the Scottish Women's Football League Second Division, South East/West. That did not deter Scotland international Suzanne Grant from joining this summer as Motherwell look to progress through the divisions. The former Arsenal and Celtic forward, capped over 100 times for her country, marked her debut with an astonishing 11 goals as Motherwell secured a 21-0 victory against Edinburgh South. Motherwell ladies have an unblemished record so far this season, winning all 10 of their league matches so far.